Hey Friends! 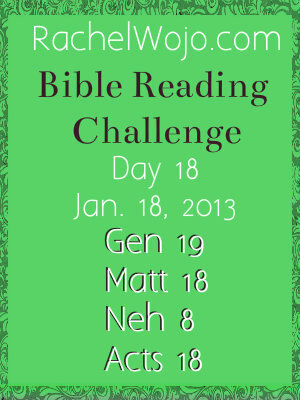 It’s Bible Reading Challenge check-in day! I wanted to have a little giveaway for you today. We’re making progress and God is blessing your faithfulness in reading His Word. Because of the giveaway, we will leave our comments, but if you want to be entered in the giveaway, be sure to follow the Rafflecopter for comments. 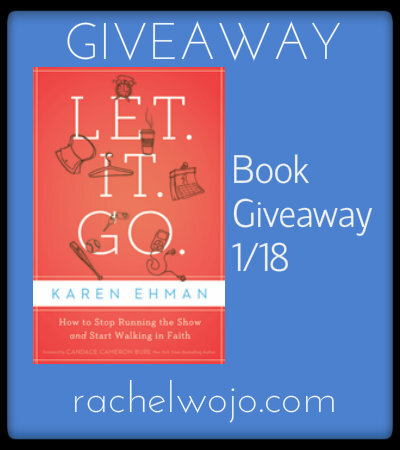 Today I’m giving away a copy of the book, Let It Go, by Karen Ehman. My Proverbs 31 Gather & Grow group is currently doing this Bible DVD study and it has been wonderful! So I know you’ll love the book. I’ve reviewed the book HERE. Bloggers: Hope you’ll be back on Monday to link-up your encouraging posts when we discuss Faith Hub: Where God and Technology Connect. I just started Monday so I’m playing catch up but it is going great!! Awesome! You can do it! My Bible reading is going well. I’m doing Beth Moore’s Patriarchs study at church, and I have enjoyed the double reading in Genesis. Thanks for keeping me on track! That’s one of Beth’s studies that I actually haven’t done. Enjoy! Last year was the first time I successfully read the Bible through in a year, and I’ve started it again this year. I am reading through the NT this year with our church. I did a year through the whole Bible two years ago. So wonderful. What fun to do it with your church! I’m also playing catch up!! Been taking care of sick ones and trying to find a job!!. Can’t wait to see where God leads me. I’m not following the challenge, I’m reading on my own. that’s ok! Glad to have you reading! It’s nice to have others participating in the challenge. Good! I’m so glad to read that. Because I am working on letting go, thank you! I’m right on track, Praise God! Thanks for being an encouragement to so many! I’m a little behind in Acts, but caught up on everything else. I found this plan on my YouVersion app, so it helps that I have that on my phone everywhere I go. I love that you are using your phone to do it!! I didn’t think I would keep up with it but I am doing great so far. I got behind, so going to restart and may take me longer to finish. that’s ok! Little at a time, right? I am reading every day , have nit missed a day. Really enjoying soaking in Gods word and promises. I’m right there with ya! So glad to be here! oh bummer. 🙁 best wishes! My son and I started on January 1. We are both still on track. i have gotten a little ahead because I love to read. I am so enjoying the challenge and look forward to my time in His word each day. Thank you!! AWESOME! Love that your son is doing it too. I just signed up for a bible study using this book from Proverbs 31 Ministries. Would be great to win it. YAY! At my friend Melissa Taylor’s hoppin’ place? How cool! Enjoy! I’m reading through a different plan which goes through the entire Bible (I have to focus on 1 book at a time, not 4!). I did it last year, and once again I am in love with how many details I’m noticing and how much of the “bigger picture” I’m seeing. It’s definitely worth doing every few years! YES on the bigger picture. Love it! That is funny! Blessings to you! You’ll love the book and study. This would be a great gift for a family member who is trying to let some things go. I have been loving your posts and I ‘ve been doing your Bible reading challenge……I am new to FB and Pinterest it has been so much fun. Have a great weekend!!!!! YAY! Love it. Thanks for letting me know and have a fabulous Friday! It is going great so far. I am still on track and still loving this plan! I have been meeting the challenge. It is different reading 4 chapters a day. Takes a little longer. I did find a verse I had never “seen” or realized in Genesis this week. Isn’t it crazy how that happens? Happens to me too. I am doing the Bible reading but am a little behind because I was sick last week. Hope you are feeling better!! Thanks for checking in and hang in there. You can do it! Also wanted to share that our children’s ministry is starting a new program. Iut will take the kids through the Bible in 2 years. How perfect! I’ve been doing my own Bible reading schedule for some time now, but I’m cheering you all on! What a wonderful challenge. Thank you so much for encouraging and leading. I am actually on track with the reading, and I love it. I’m so glad God led me to your site on Pinterest, I’m really enjoying reading God’s word every day. It really helps knowing I’m doing it with others, I look forward to checking my emails to see yours for the days reading, and to see what you have to say. God Bless everyone who is doing the challenge and may He continue to strengthen all of us. I just found you and I am just starting the challenge. I’ll let you know how it goes. Thanks so much for the encouragement. So happy to have you on board! You can catch up gradually- no sweat! You are welcome. Enjoy! The readings are going well, I’m just real bad with checking in! HA! You and a couple thousand others. lol 🙂 Thanks Melinda! Yeah! I’m on track! This is a great accomplishment to be on track. I have been reading daily devotion from the Bible for over ten years but the one thing I haven’t completed after many tries is to read the Bible through in one year. I noticed several scriptures from this weeks reading, I have previously studied but forgot the little details. Brings a smile. Today specifically blessed in being reminded that the joy of the LORD is my strength from Nehemiah 8:10b . Thank you Rachel for the encouragement and daily posts. Praying for Taylor and a blessed weekend. I started this plan late, on Jan 14th, but have stayed on course this week. I’ve already caught up on Nehemiah, and tackled all of Ezra this morning. (Guess that was in backwards order, huh?) Can’t wait to see how the Lord speaks through His Word to all of us this year! Even if I am late checking in, or don’t at all some weeks, it helps knowing so many others are here, reading faithfully, checking in and encouraging one another. I can always read the messages that have been left whenever I have a minute, and I’m sure I will feel more motivated than ever to stay on track! YAY!! That is so very awesome on the reading! You can do it. Just keep going along little by little. Day by day.Thank you so much for your comment. Blessings to you! 18 days into reading the bible daily and I’m a change woman! I got behind on Tuesday but caught up on Wednesday! I just love the Books of Matthew and Acts! I’m just starting this bible study! Hi, I am a brand new blog follower and I look forward to starting the Bible reading challenge. I’m am just starting this study but love it so far. Love you blog and all the encouragement. Thanks Marissa!! Blessings to you! Not doing the challenge…. because I don’t have the book! I so want to study this book with a group. I was notified in November that I had won it, and I really had felt God was leading me in it, and I still do. But I have not received the book, I wrote snap last week, to ask what had happened but no response. Maybe I will win now and can bring it to my church? That would be a great blessing. Really loved today’s reading in Nehemiah 🙂 So happy to be a part of this! Continuing to be inspired by His Word! You can! Little at a time. 😉 Glad to have you! Reading daily some is better than none!! THAT is early. Give yourself grace and keep plugging along. 🙂 So glad to have you!